In the last few decades, many churches have made major changes in the way they conduct worship. 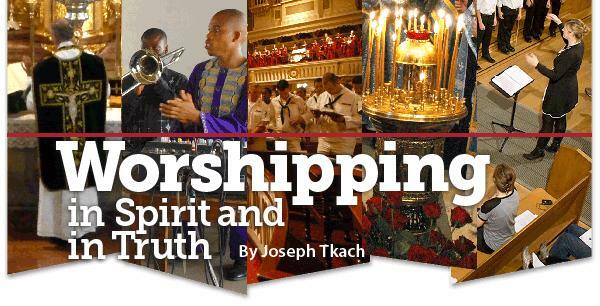 They have become more flexible and even adventurous, realizing that “praise and worship” (as worship in song and prayer is often referred to) is an important component of the service. Congregations that formerly were extremely conservative and tradition-bound have learned to embrace multiple music styles. They have also learned the importance of gifted worship leaders, musicians and others who facilitate worship. Many churches, who previously would not have allowed anything but a piano or organ to accompany the hymns, now have praise bands. We have seen the increasing use of electronics to enhance worship. Something important is being lost in the clamor. Worship is so much more than just what style of music you choose, or what gizmos you hook up to go along with it. So let’s remind ourselves of what worship is, and why it is important. Worship is an interesting word. It comes from an Old English word, weorth meaning “worth.” In its earliest form, weorthscipe (worth-ship) meant the appropriate treatment of something or someone of worth. So worth-ship or worship is the act of affirming God’s worth. It is a declaration that God is worthy — to be praised, preached about, confessed to and served. Jesus makes one of the most pointed scriptural statements concerning worship in his encounter with the Samaritan woman. Living in a society polarized over the details of “getting worship right,” this woman seized the opportunity to ask Jesus about it. “I can see that you are a prophet,” she said. “Our ancestors worshiped on this mountain, but you Jews claim that the place where we must worship is in Jerusalem” (John 4:19-20). Jesus explained that the physical details of worship were not most important. “A time is coming and has now come when the true worshipers will worship the Father in the Spirit and in truth, for they are the kind of worshipers the Father seeks” (John 4:23). The true worship of God is expressed in a number of ways. We see this by noting that there are three basic meanings to the Greek and Hebrew words translated as worship in our English Bibles. The first meaning is that of praise and adoration. We express this when we sing and pray (together or individually). The second meaning pertains to public or ceremonial gatherings, like church services, where we sing, pray and fellowship together. The third meaning, which is the broadest, is to serve. In the Old Testament, the Hebrew word abad is used for both worship and for work. The Greek verbs for this meaning are latreuo and the similar word leiturgeo, which is the root word for our English word liturgy. The most important point about worship is found in the New Testament book of Hebrews, where the risen and ascended Jesus is said to be our leitourgos (“minister”); our worship leader (8:2). He leads us in worship, conveying all of God’s graces to us and taking all our responses to him, sanctifying them and giving them to the Father in the Spirit. Our worship of God, with and through Jesus, can occur in large groups and small. For the first 300 years of Christianity, church services occurred mostly in homes, and therefore in small groups. That original pattern carries the blessing of simplicity. The early church did not set up banks of amplifiers, speakers, soundboards, microphones, projectors, organs and such. These resources are not needed in small congregations. In fact, it would be ridiculous to set up for a group of 250 people when there are only going to be 10 to 20 people in attendance. Sitting in a circle is just as good as sitting in several rows — in fact, it is often better for small congregations, providing an intimate environment where genuine, quality worship can happen. So let’s remember that, although advanced technologies and live praise bands can enhance worship, they are not essential to worship. A small congregation need not feel inadequate because its worship service is not a “mega-media-event.” Keep it simple — make use of the resources you have, knowing that God will meet you where you are. Instead of becoming preoccupied with the mechanics of doing church (like Martha in the kitchen! ), embrace the freedom that Jesus gives you to focus on worship (like Mary at our Lord’s feet). Remember what Jesus told us: “For where two or three gather in my name, I am there with them” (Matthew 18:20). Churches with a “non-liturgical” worship tradition tend to equate liturgy with formal worship that incorporates standardized prayers accompanied by what my friend Professor Eddie Gibbs describes as “bells and smells.” Though a “liturgical” approach toward worship might seem contrived and artificial to those used to a less formal style, it is perfectly valid when given to the Father, through Jesus “in spirit and in truth,” as Jesus explained to the Samaritan woman at the well. But if we limit our understanding of liturgy to this particular worship style, we miss something important. Liturgy is not just something that “high churches” like Roman Catholics, Anglicans and Eastern Orthodox Christians do. Whether we recognize it or not, liturgy is fundamental to the rhythm of a Christian’s daily life before God. The original meaning of leitourgia is a public duty or a service to the state undertaken by a citizen. A leitourgos was “a public servant.” In ancient Greece, leitourgia was performed by wealthy citizens at their own expense. It was not limited to religious good works. Any general service of a public kind could be described as liturgy (and a person who did not accept his public duty was known as an idiotes!). In Romans 12:1, Paul writes, “Therefore, I urge you, brothers and sisters, in view of God’s mercy, to offer your bodies as a living sacrifice, holy and pleasing to God — this is your true and proper worship [latreia].” He saw a parallel: as citizens of a community accepted their responsibility for public service, so Christians should make themselves available to God for the work of the kingdom. Paul also draws from his own Jewish background of sacrifice associated with temple worship. The sacrifice here seems to represent an act of total self-giving of one’s life for the benefit of and in response to God’s mercy. But notice the radical transformation of the idea of sacrifice. In ancient Israel, the animal gave up its life as it poured out its blood. The life was given over for others so that it became dead. Here Paul proclaims that we are living sacrifices, continually self-giving. Where did Paul get that striking insight? From the gospel of grace he laid out in the previous eleven chapters! Our sacrifice is a mirror image, reflecting the self-giving of Christ, who passed through death to eternal life, never to die again! We join in and participate in Christ’s own liturgy of pouring out his life even to the extent of death, but in a way that leads to fullness of life. Christ’s own worship transforms the very notion of sacrifice and worship. Paul goes on to say: “Do not conform to the pattern of this world, but be transformed by the renewing of your mind. Then you will be able to test and approve what God’s will is — his good, pleasing and perfect will” (Romans 12:2). Our sacrificial worship demonstrates a whole new pattern of living that comes from sharing daily in the grace of Christ, our crucified, risen and ascended Lord. We read in Hebrews 8:2 that as one of us, in our place and on our behalf, he is our worship leader in every moment of our lives. In union with Christ, we daily die to ourselves in repentance and rise with Christ to newness of life through faith in him. So you see, liturgy is not just something “religious” we do in church, or when we pray or study the Bible. It is characteristic of the whole rhythm of our daily life. When Paul admonished Christians to “pray without ceasing” (1 Thessalonians 5:17, KJV), he was not saying that we continually pray and never stop. The Greek word is used outside the New Testament to describe a hacking cough. When you have a hacking cough, you are not coughing all the time, but you feel like you are. That is what it means to pray without ceasing. It means being in an attitude of prayer at all times. So, when I say that worship is the rhythm of daily life, it is like saying that we “pray without ceasing” — just as we breathe without ceasing. In his Sermon on the Mount, Jesus showed how the practical aspect of living and worshipping in “spirit and truth” can be more important than engaging in more noticeable religious behavior. “Therefore, if you are offering your gift at the altar and there remember that your brother or sister has something against you, leave your gift there in front of the altar. First go and be reconciled to them; then come and offer your gift” (Matthew 5:23). Whenever Christians are drawn together into Christ as the common center of their desire and faith, it is worship. Jesus’ teaching of a process to eliminate conflict between fellow-believers includes purposeful fellowship, prayer, and church involvement so that forgiveness and reconciliation can occur when there are members in conflict (Matthew 18:15-17). This act of reconciliation is worship. The temple in Jerusalem was a liturgical place that involved more than sacrifice. At its dedication, Solomon prayed, “May your eyes be open toward this temple day and night, this place of which you said you would put your Name there. May you hear the prayer your servant prays toward this place” (2 Chronicles 6:20). We no longer have (nor do we need) a physical temple. God’s people are God’s temple — built up by the Holy Spirit, where acts of sacrifice and service continue day and night, “without ceasing” as together, we share God’s love and life with those around us (1 Peter 2:5). Worship is much larger than what we do when we attend church. Authentic worship is how we conduct our lives at all times. Or as Paul wrote to the Corinthians, “Whether you eat or drink or whatever you do, do it all for the glory of God” (1 Corinthians 10:31).